It's nearing the end of summer, but there's still lots of time to use those fresh veggies. I love the flavors of Greek food and this dip will fit perfectly into that category. I have made this low-calorie dip several times over this past season and it's been a hit. It's simple and easy to make. Prepare the ingredients ahead of time and layer it just shortly before serving as the cucumbers tend to get watery if they sit too long. Combine yogurt, dill, garlic, lemon juice, salt and pepper in a small bowl. Set aside. Chop and prepare your vegetables and assemble just prior to serving. 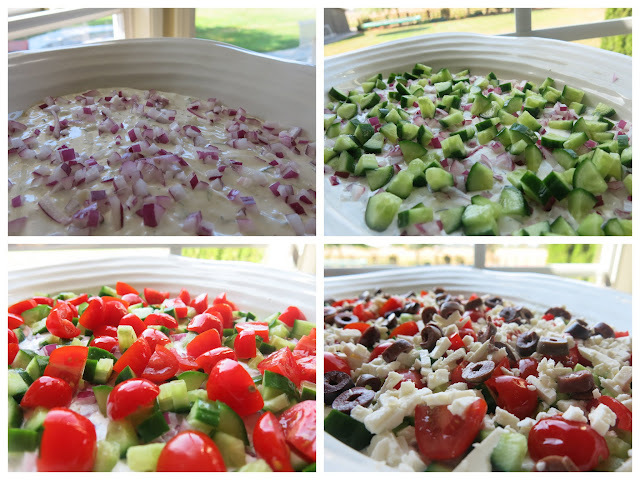 In a 7x11 or your favorite serving dish, layer the hummus, yogurt mixture, red onion, cucumber, tomatoes, feta, and olives. I have also prepared it earlier and carefully drained the excess water. Serve together with whole grain pita chips or taco chips. It's a perfect dish to serve prior to supper or to end off an evening around a campfire. What a great combination of flavours!